Sometimes the simplest snacks are the best. I suppose the above snack isn’t going to win me any awards, but I still wanted to feature it. I think that the Food Network has warped our vision of cooking. Can you use a lowly toaster oven and get a great dish? I haven’t seen any of those top chefs use a toaster oven, but I think toaster ovens can be very gourmet. If you have a toaster oven or an oven with a broiler, I would attempt this recipe as a breakfast, lunch, or snack item. To keep the calories low, I weigh the cheese. I know that sounds kinda wierd - WEIGH THE CHEESE - but I can tell you that I will keep piling on cheese if I don’t give myself a defined limit. I have a kitchen scale that I use to weigh the high calorie foods (meat and cheese) to keep me in check. I use it when I write recipes for the site to be sure I have the right amounts, but I also think it is a great idea for everyone who has an issue with portion size. What is so cool about getting a handle on one ounce of cheese is that you begin to see how far it will take you. Full fat cheese with a strong flavor, like sharp cheddar, is utterly unreal melted. Add it to a fresh tomato (I like the ones on the vine) and your taste buds will likely sing some upbeat pop song. I have tried a bunch of “reduced fat” cheddars and I just hate the way they taste. Instead of using them, I just weigh the cheese. Do you have a cheese problem? How do you deal with it? Preheat broiler or toaster oven to high. Put crackers onto cookie sheet and place tomatoes on top. Sprinkle the tomatoes with salt (optional). Add thin slices of cheese and place under broiler for one minute. Remove when cheese has melted. Enjoy! My husband makes these for breakfast several times a week. Yummy and so gealthy! Hi Lisa, I have been a fan for several months now and always check my email for your latest post. This one caught my eye. I thought it was a raisin bagel - do you think that would crush the healthiness. The idea of the sweetness and tomato - yum! Will try. Thanks for all the great tips! I make this on a piece of whole wheat bread that I spread a slice of avocado, tomato and cheese. Good point about full fat cheese. Also low fat cheese has more salt for those that have to watch. Yum!1 I love this idea! I have made it before and I love to throw on fresh basil!! I LOVE cheese. The only fat free cheese that I like is sliced Borden Cheddar, everything else just doesn't seem to have any taste. Melting is a problem too. Portion control is the key for me. Laughing cow and cheese heads low fat string cheese are my preferred choices (pre-packaged for portion control). 2% Velveeta is great for homemade mac & cheese and dips, you don't even miss the fat. When going crazy with cheese... I usually mix 2-4 portions of fat free cheese with 1 portion low/high fat cheese. You are right, a little full fat (and even some low fat) does go a long way. The above recipe reminds me of my favorite english muffin pizza recipe! I use light english muffins, chunky salsa (no sugar/fat) and low fat cheese head string cheese. They can be made in the toaster over too. Yummy! Mmmm... I bought Wasa crackers, but haven't done anything with them yet. I know you've featured it before but those Laughing Cow cheese wedges are great for portion control - cheesy, but only 35 cal (1 Point) - I also love my Parmesan grater - a small chunk goes a long way! Keep the tips coming - sometimes simple is better! The toaster oven is total sleeper-kitchen appliance gold. Why do more people not talk about its wonder?? 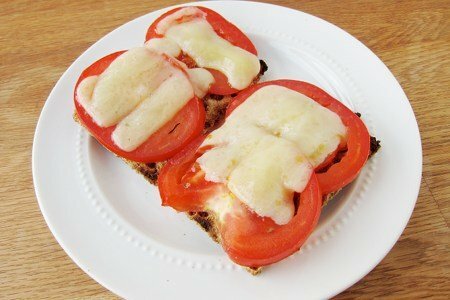 I love tomatoes on my grilled cheese, and the crackers are such a fun twist. Plus the crackers you suggest are HEARTY, so I bet this is a super filling munch. Looks so yummy, and l love how simple it is. Going to make it today! Do you think any other veggies would be good? Peppers maybe? This looks yummy! I love cheese as well and found the low fat versions did not measure up as far as taste. So I use a food scale. It's sad how little 1 ounce is but I feel better knowing I'm using the right balance. I make this using weight watchers whole wheat or multigrain bread. I also love a good whole wheat/sharp cheddar/tomato slice combination. However, I made one modification to your recipe: GARLIC salt, rather than regular salt. Honestly, garlic salt is probably my favorite seasoning. Anyway, it adds another element to contrast to the sweetness of the tomato. I loved broiled tomato with mozz. cheese! I usually leave the cracker off and put some sauce on top of the tomato, then top with fine shredded cheese. I kid. Yes ma'am.. I do indeed have a cheese problem. How do I deal with it? Shredder baby!. One ounce of shredded cheese covers more "ground" than sliced.. Easier to get my beloved cheese in every bite! I use my Breville toaster convection oven all the time. Also I have been using Daiya instead of cheese which I really like. It melts, stretches and tastes like real cheese but it is made out of tapioca and other vegan ingredients. Try grating the cheese; I'll bet you can get by with half an ounce and eliminate 1 and a half points! Looks yummy. May I recommend on of my favorites for grilled cheese? Cotswold - comparable to a cheddar, with chives blended in. Mmm. This, with addition of freshly sliced tomatoes, is match made in heaven. While we're on the very timely subject of toaster ovens (I'm searching high and low for one for my family), any favorites out there? I love my cheep ($20) toaster oven with broiler. Much of my cooking is in small stainless steel dishes in this oven. It is so versatile, and the finished product is superior to that of a microwave, which I avoid. When I need a cup of hot water, I have an electric kettle for that.